Have you ever noticed that when people get together to do something like pick blueberries things change? 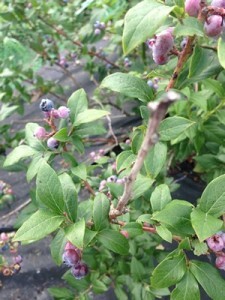 The Accidental Locavore noticed last week, in the middle of a blueberry bush, that people pick blueberries and quietly chat. Recipes are swapped, children munch on many more berries than they pick and everyone is united in a simple task. 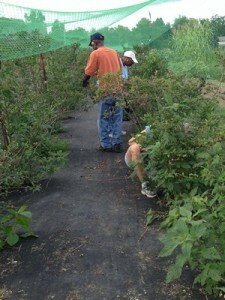 Newcomers are happily told to go to certain areas or rows where there is an abundance of fruit. And it’s just a warm and sunny summer afternoon. Compare this to the frenetic energy of the Manhattan Greenmarkets, where scoring the perfect box of blueberries, or anything else, can take on a death-match quality – people impatiently waving bills to get the farmer’s attention, while dogs and children get underfoot. At the farm, it’s peaceful, warm and a collaborative effort. And yes, as is almost traditional, a certain amount has to be tasted. A gentleman near me was explaining to his companion that the berries “closest to the sun are the sweetest” so of course, I had to see if his theory was correct (still testing). For me, picking high-bush blueberries is as close to a treat as picking blueberries can be. It’s been years since I was in Maine at the time when the wild blueberries are ripe. There the berries are tiny, hidden and nestled close to the ground. It helps to be short-kid-sized, so you don’t have to bend down too much, unless you can find a good bush and just sit down until it’s depleted. Wild blueberries are so small it takes a lot of them to fill up a cup for muffins, tons for a pie and loads of self discipline to make sure you come home with your little bucketful. The omnipresent mosquitoes literally tend to make it a blood sport but sometimes that just makes you pick faster! 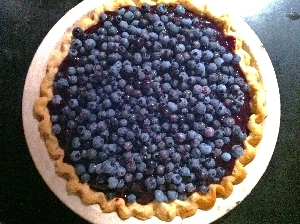 Some people (and you know who you are) think that any blueberry that is larger than the head of a pin is an inferior product, but now having had them straight off the (high) bush, I still prefer the meatiness of a bigger berry. But you know, anything freshly picked and eaten right away is always the best – right? So what’s your favorite thing to do with blueberries? I’m going to remember to have my mother make a batch of blueberry corn muffins next week when I’m up in Maine and Frank will probably beg for a raspberry-blueberry pie! I can rarely get the blueberries inside without eating them all up, but if I can Blueberry muffins are my favorite.